Today marks the launch of Get Reading 2011, an Australia-wide program designed to promote books and writing. 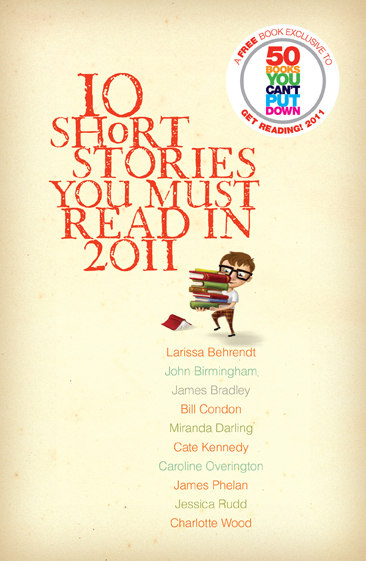 As part of the campaign anybody who buys a book in a participating bookshop will receive a free book, Ten Short Stories You Must Read in 2011, featuring contributions from John Birmingham, Charlotte Wood, Caroline Overington, Cate Kennedy, Larissa Behrendt and myself (amongst others). I haven’t seen an actual copy of the book yet, so I can’t wax lyrical about the contributions of my fellow authors, but I can say I’m pretty pleased with my story, ‘The Flats’, which is set near where I grew up in Adelaide, and is about three boys who accidentally see something terrible. As I say, the collection is being given away for free with any purchase at all participating bookshops. My understanding is bookshops will also have copies of this year’s 50 Books You Can’t Put Down guide, but if you’re in a hurry you can also download it from the Get Reading website, which also has information on the various events taking place as part of the program and links to download the Get Reading 2011 app. You can also find Get Reading on Twitter and Facebook. Get Reading 2011 runs until 30 September. Giant, ‘hurrah’, Mr Bradley! It’s probably worth noting that this wonderful deal is only available until Sept 30th, it seems.